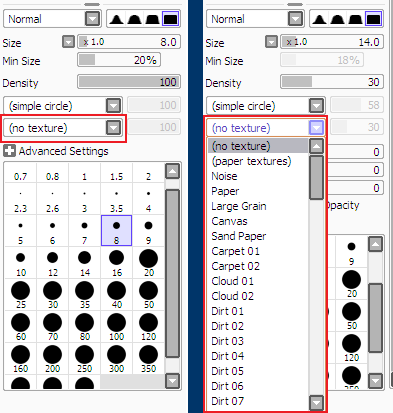 The easiest way to install new brushes and textures in SAI is to understand how it works. I’ve personally found that tutorials or step-by-step guides are more confusing rather than helpful. My approach is to explain how SAI works instead. Don’t worry, it’s not complicated! 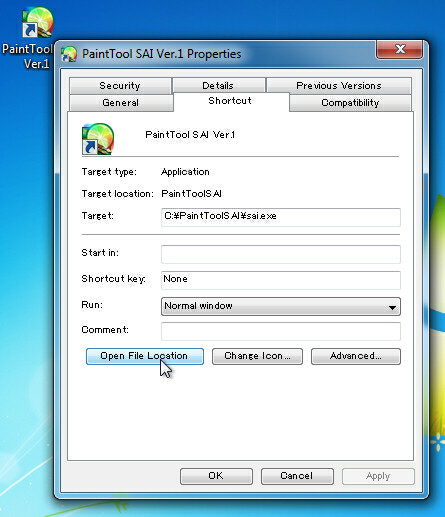 Locate the PaintTool SAI icon with which you launch it on your computer. It can be located on your Start Menu, or your desktop. Right click on the icon and you’ll get a menu like this. Click on Properties. A window will appear. Click on the Open File Location button. A new window will appear. This is where your SAI is installed with all its system files. Not that difficult, huh? The only folders that interest us are blotmap, brushtex, elemap and papertex. If you open any of these folders you’ll see they contain BMP files, which are image files just like JPGs or GIFs. We are only interested on these configuration files: brushform.conf, brushtex.conf and papertex.conf. What are these files? They are lists of the things we described above. SAI handles three things: brush shapes, brush textures and paper textures, remember? Well, these three files are the master lists of those. brushform.conf – Like its name says, this file contains the list of brushes forms (i.e. shapes or maps). brushtex.conf – This file contains the list of brushes textures. papertex.conf – Pretty straightforward, right? This one has the paper textures. Double-click on a conf file to edit. 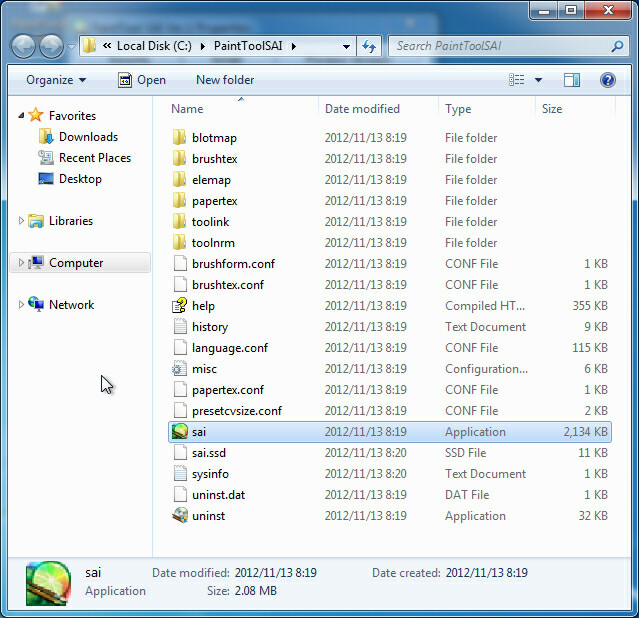 Notepad should open with the file contents. If there’s an “Edit” menu item, click it. Notepad should open with the file contents. If there’s an “Open with…” menu item, click on it. If a submenu opens, choose “Notepad” from that submenu’s items. 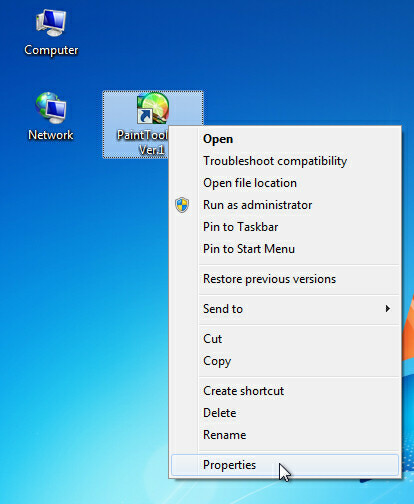 If there’s an “Open with…” menu item, but a new window appears instead, choose “Notepad” from the list of programs. Sorry if I didn’t provide screenshots at this point. 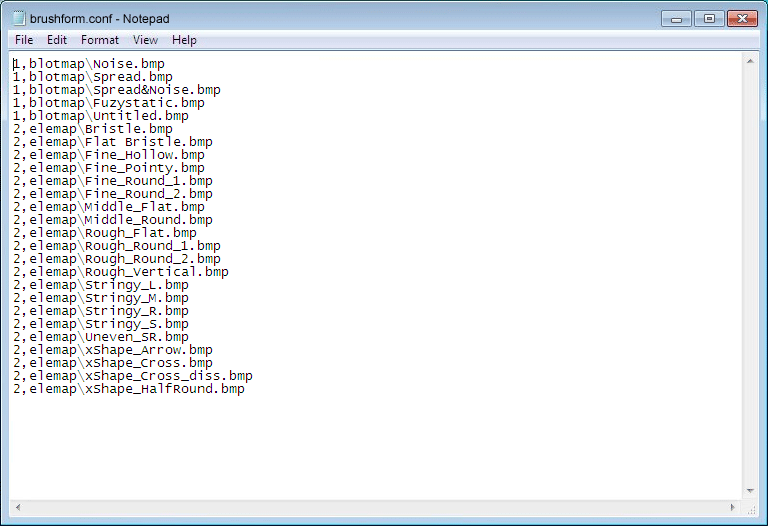 Where blotmap is the folder and Noise.bmp is the BMP image file we’re referring to. For brushtex.conf and papertex.conf, the number is always 1. No worries there. For brushform.conf, the number is 1 for blotmaps and 2 for elemaps. Remember we wrote before there were two type of brush maps? Go to the folder where SAI is installed. 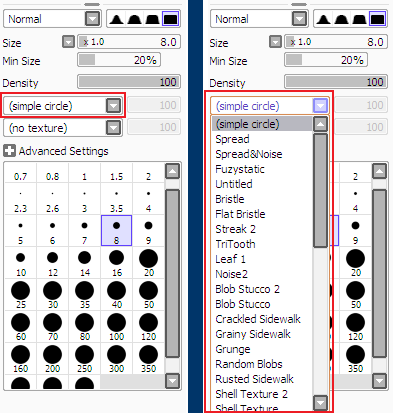 Copy or uncompress the new brush or texture image files on the folders specified by the brush or texture author (i.e. elemap, blotmap, brushtex or papertex). Edit the corresponding conf file or files. Restart SAI (quit and open it again). Usually you’ll download a brush or texture from a source and the author will try to explain how to install them. And usually the part where everything gets confusing is in editing the conf files. If the author provides a conf file, always remember you should never overwrite yours with it. You’re expected to append its contents to your own conf file. 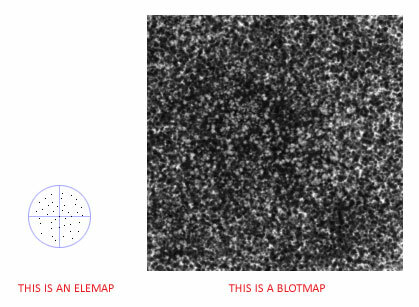 For Brushes, there can be two types: a blotmap or an elemap. If the file is a blotmap, put a number 1. If the file is a elemap, put a number 2. You can add this line anywhere you want in the list. I usually move a brush to the top when I use it frequently and becomes a favorite. Thank you so much for posting this and the brushes/textures! This helped me so much! YOU LITTERALLY MADE MY *LIFE* THANK YOU SO MUCH!!! Okay so I followed everything on here but my sai still didn’t show any new textures or anything. is there a difference if i’m using windows8 or am I just missing something crucial…. Hello Noa, it shouldn’t be different. Perhaps if you try doing the opposite, try removing a texture and see if that modification works. Hey so uh recently I had to update Sai from a 2008 version to an updated 1.1.etc version, and apparently the .conf files for both brushtex and papertex vanished. I created new wordpad documents and wrote the .bmp files in for both, saving the documents as .conf, but Sai isn’t recognizing either of them. It’s weird because it’s still recognizing the brushform file, and any changes I make to it. Hello Burr. That’s weird, all of these articles were written with SAI version 1.1.0’s files. Maybe it would help to make a backup, uninstall and reinstall from scratch? Ah, I found the issue. The respective .bak files for each are gone. Lord only knows what happened to them. I’ll have to download another copy, and move the appropriate files over. Thank you for the assistance. SAI doesn’t work on a Mac, AFAIK. It does. There is a version for Mac. Hi Rex, I know for a fact that the BMP image must conform to a certain “format,” mostly about its color depth, if I remember correctly. Otherwise, SAI ignores it. Are you using the BMPs I supplied? Yes, a few of mine including xShape_HalfRound were originally missing from my files so I downloaded them from here. Rex, in order to discard you are editing the right file, can you temporarily remove a working elemap line from brushform.conf and see if it’s also removed from SAI? If it doesn’t, then you are editing the wrong file. While I was trying to do this, I noticed that the drop-down menu wasn’t showing any of the textures after T alphabetically, so I messed around a bit and after I rearranged the names so the few I wanted were near the top, they started showing up in the menu. I guess I just have too many or something, but either way I can use the ones I wanted now, so thanks for the help! Thank you so much for this! But I’m kinda confused though, I already installed new brushes in the correct folder, restarted SAI, but some brushes just don’t show up. I added their names in the conf file too but nothing changes. So I’m wondering is there perhaps a limit at how many brushes you can install in one folder. Is it? Akitsuki, there is a maximum limit, indeed. See the comments before yours of Rex. I can’t tell how much it is, as I don’t have that many. The textures won’t work for me D: after all my hard work too. i followed the example so i don’t know whats wrong! ki: You are supposed to “unzip” the file you’ve downloaded. Thank you so much this has been so helpful!!! Wow, this has been so useful for me! In the beginning, I had totally messed up(as in, I deleted some folders I shouldn’t have deleted) from other unclear tutorials and such, but this was so useful! It was a bit complicated since I’d accidentally deleted the papertex folder, but I just remade it, and it all worked out fine! Hey! Your tutorial is super helpful, so thank you! But I’m wondering if you can help me out with a bizarre problem I’ve had recently. I’ve installed textures and brushes into SAI before with no problem but I have too many! I know SAI will only show a limited amount in the drop down box, so I decided to delete some of the ones I didn’t use. I erased the names from the brushtex configuration file and saved it (though i didnt actually delete the images from the other folder incase i wanted to use them again), but the names restored themselves? So I can’t get to the new textures because I have too many of the old ones! Any ideas as to why my brushes wont stay deleted? Sounds to me you are editing some other configuration file or maybe you have duplicates entries. Try leaving just ten or so to find out. i followed the steps and saved, but when i open sai there are no new brushes. and the data in the files looks now a little bit different. fading_kath: Can you explain how are they different? Everything worked except my brushtext folder additions, they show in the folder but not in the program, any tips? I went back and fixed a couple things and now it is working perfectly! Thanks so much for explaining all this! Thank you so much for posting this! It was super helpful and easy to understand. Does anyone know if you can install textures and things on the free version of Paint Tool SAI? I think you mean the Trial, which actually is the same application, which means the answer is yes, you can install textures and brushes on that “version” too. one awesome helpful post! keep it up man!! amazing! Thank you so much! I really appreciate it! My laptop recently went through an update and for some reason all the files were there but they wouldn’t show up in sai. It turns out the update altered the structure of the files and I was able to go into notepad and manually correct the files! It was very helpful and I appreciate the help very much. Much luck with any art! 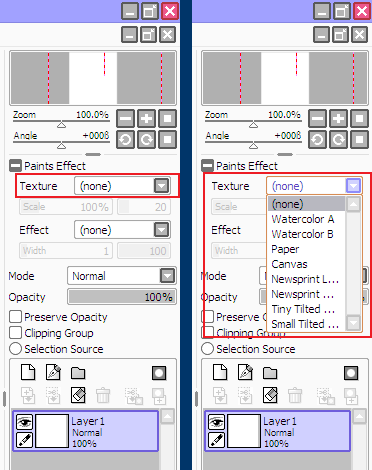 Hi, I’m pretty new to SAI, and I think I followed what you were saying up until you got to the actual “How To Install New Brushes and Textures” part where you lost me. I don’t really know what you mean when you say “Edit the corresponding cons file or files” in number three, and am very unclear about exactly /how/ to transfer the texture files etc. /into/ the SAI program. Your help with this would be so, so greatly appreciated. Thank you! Naomi: The step three you mention refers to the previous explanations of the SAI Config (“conf”) files and how to edit them (titled: “THE SAI CONF FILES” and “HOW TO EDIT A SAI CONF FILE”). Hello! I have a small dilemma that I’m not sure how to fix. While I was adding brushes and textures, I noticed that the Bristle and Flat Bristle (which were included in the first place when i downloaded it) suddenly wont show and I’ve deleted some lines and even retyped the two brush lines but still no results. Is there any way I can fix this? Can I somehow revive the original ones, or…? Thanks for the help, but I’m still puzzled by something. A lot of people who purchased Paint Tool SAI have been known to have tools like ‘Oil Waste’, ‘Inkpon’ and many more. These tools apparently came with their installation and yet I don’t have these tools. I’ve tried searching on the original website for answers but I have never been able to find any. Do you know if these tools need to be accessed by downloading a different file or are they somewhere in my SAI folders? Sarah: You’re not the only one. I purchased SAI from Systemax itself in 2011 and, like you, I’ve stumbled with artists having other brushes in their default installations. There are no extra download packs from Systemax nor extra brushes in other folders. If their copies are indeed legitimate, I cannot explain how this is so. This is possibly one of the clearest, most useful not-quite-tutorials I have ever encountered. Thank you beyond words for your help! Thanks, OdinOddly! Glad you found it useful! YOU SAVED MY LIFE omg I’ve been trying to install these new brushes for months now and I always ended up failing… It finally workes ;_; You’re an angel rhfoprzhgieh THANK YOU ! If anyone can, please help. This might be a long comment, but PLEASE READ! When I try to open the conf file for brushtex, it shows 2 picture, they are grayscale and they show different textures, but at the beggining, it says that there are going to be 2 jpeg picture thing. I want to download Flat Bristle. I have Notepad++, is that what I am supposed to be using? 2. Can someone send me a link to the Flat Bristle texture? I wanna make sure I have the right one, which I think I have? Micro: I’m afraid I don’t quite understand you. Anyway, I’ll try to answer the best I can. Notepad++ is OK and should be able to open the “.conf” files. You might want to try opening Notepad++ first and use its Open File menu option to open your .conf file. Download that file and uncompress it. But I’m more of a visual learner so all this reading and following has me lost. “Copy or uncompress the new brush or texture image files on the folders specified by the brush or texture author (i.e. elemap, blotmap, brushtex or papertex). Danya: Sorry if this is too confusing for you. This is not meant as a quick guide, but rather a “slow” guide. Clearly, you haven’t understood up to the point you quote. I ask you to read again from the start with patience or maybe try some other guide. Sorry if this is not helpful. Okay, a few questions: I am looking at my Notepad with the conf. files open and somehow when I moved the files of the new brushes over to the program’s files, it filled all the brushes in for me. Was this supposed to happen or did I do it wrong? Also, I am noticing that about half of my brushes on the Notepad say “em.bmp” and the other half of them say “.bmp”. Is there supposed to be an “em” before the “.bmp”? I thought maybe it was just from the brush name but I looked at your Notepad on the screenshots and the same brushes you have do not have an “em” before the “.bmp”. I really don’t want to waste a lot of time removing the “em’s” and having to add them back on. Please reply quickly because I want to be able to use my new brushes ASAP! Gina: About the .conf files, it seems to me by copying the new brushes you’ve overwritten your .conf files. Please verify your old brushes are still there. About the “em.bmp” thing, the names in the .conf should match the names of the brushes images files. If your files are named “em.bmp” then keep them that way. I can’t install your brushtex and I have followed the guild and everything. What am I doing wrong and is there a limit to how many brushtex I can have???? Cliff: I need you to be more specific to help you. Yes, there is a limit, tho I don’t know what the exact number is. Oh my goodness, I have been trying to find out how to add my own or extra brushes for years. I have scoured the web for hours and hours, without result until I read your website. You don’t know how happy I am, I almost want to cry. Thank you so much, your admiration will be on my lips more months. For months, not more months, haha. Is it possible to add brushes that aren’t BMP files? I downloaded some Photoshop brushes that are ABR files and I don’t know how I’d add them to SAI. No, SAI is unable to read Photoshop’s brushes (ABR files). thank you so much for taking time to explain this, really, your a saver! Hey! I was wondering if it was okay if I… kind of… “overwrote” the .conf files? There’s no other way for me to edit them, so what I would do is create a new .conf with the same name and then delete the old one. Thank you for your help! Hadriel: No problem with that, the end result would be the same. Just do it with care.